Crude Runs at US refineries decreased significantly indicating the start of the refinery turnaround season. (Parts of the refineries are shut down for maintenance and changed to producing winter fuels) Crude Runs decreased from 17.42 million barrels per day from the previous week to 16.51 million barrels per day, or 900,000 barrels per day (Chart 1, black line). 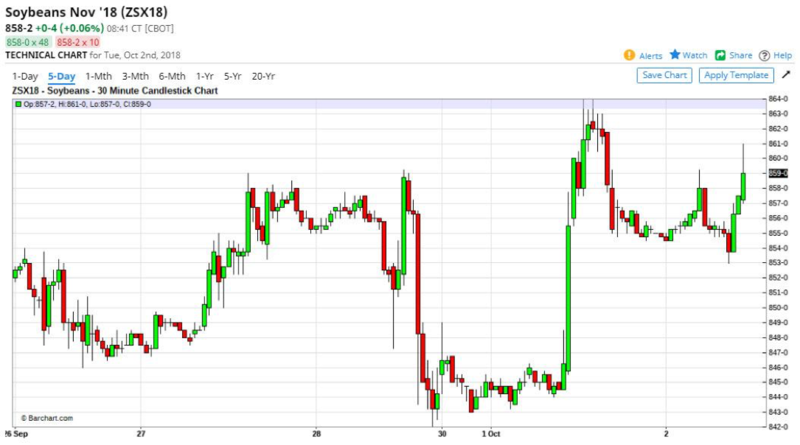 We expect Crude Runs will continue to decrease until mid-October. 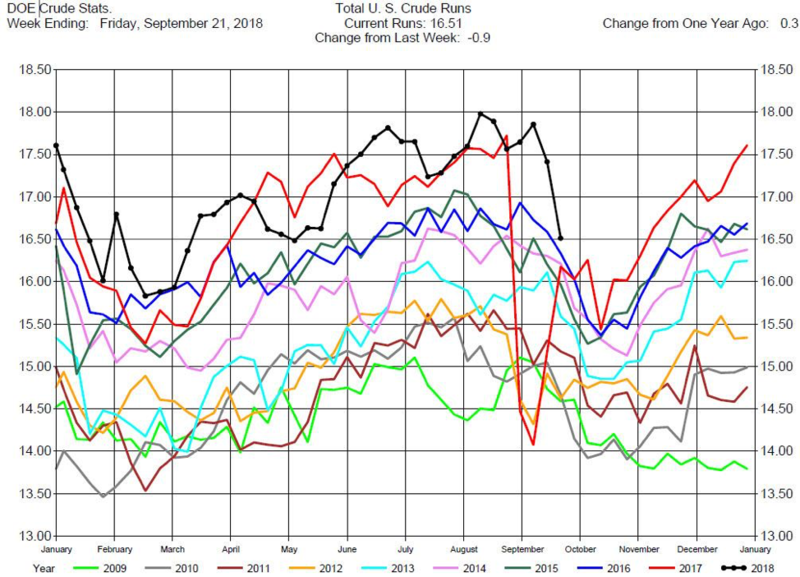 The reduced Crude Runs explains, in part, the Crude Stocks increase of 1.85 million barrels for the week ending Friday, September 21, 2018. Reduced Crude Runs would suggest bearish pressure on prices, but traders do not believe that crude oil supply from OPEC, Russia, and the US will be sufficient to offset the loss of Iranian supply. So prices are surging. We recommend consideration of being long WTI Crude Oil calendar spreads or the Brent – WTI product spread. Grain markets rallied on Monday, reversing the steep losses during Friday’s session, after the United States, Canada and Mexico reached a deal on a trilateral pact, USMCA , to replace NAFTA. The price of December corn jumped 2.7% to a seven-week high of $3.65 per bushel (Chart 2), and has continued to rally today , as the new pact eases concerns that Mexico – the biggest importer of U.S. corn – might have turned to competing producers. 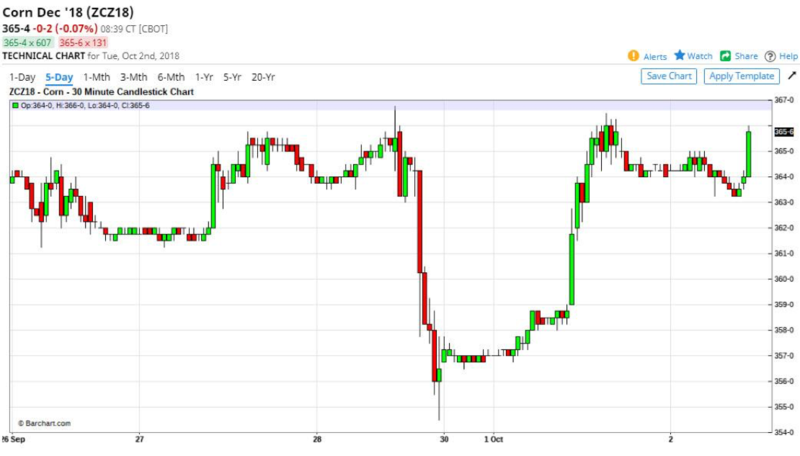 The November soybeans contract gained 1.5% to a six-week high of $8.57 a bushel (Chart 3). The rallies countered Friday’s bearish USDA report that showed larger-than-expected stocks of both commodities. From a trade perspective the fundamentals remain bearish and the long term trend is downward, so this may be considered a short term rally in a bear market. We recommend staying on the sidelines with this current market.